How machine tools R&D helps drive gear manufacturing productivity. How lean manufacturing principles can help transform your gear manufacturing business. Joe Arvin of Arrow Gear gives his insight on what it takes to succeed in today's gear industry. The complete product news section from the July 2008 issue of Gear Technology. 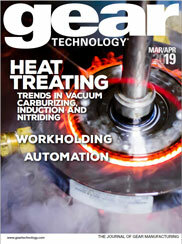 The complete Industry News section from the July 2008 issue of Gear Technology. A new breed of blossoms sprouted this spring in York, PA cultivated from gears, sprockets, railroad spikes and other recycled metal items.